Wait, who does what now? Telecom as Training Project Manager, I work with so many different people and areas. On a new project, I often write down the name of someone new I’ve never seen or met before. Once I’m back at my desk, you can bet I’m trying to figure out what area of the company that person works in. It’s important to know what role each person of the project team is playing because those roles help define the work they do. Knowing your role on a movie set is equally as important. In my previous blog, I shared some of the history and use of the slate in movies – something that, while used in many movies, people didn’t seem to know why. Today, I’d like to take a look at a few roles that you may have seen in the credits but had no idea what that role was all about. For me, it’s important to give some credit to all the people to make a movie possible, so I will be one of the few people in the theatre who watch the credits until the end. Sometimes, it’s totally worth it – you might catch a stinger (or extra movie clip) at the end of the credits or I might see a new role or title of someone who did something in the movie. Like titles at work, sometimes it’s confusing to know exactly what a person is doing. For instance, what the heck is the Gaffer? Can the Best Boy be a girl? 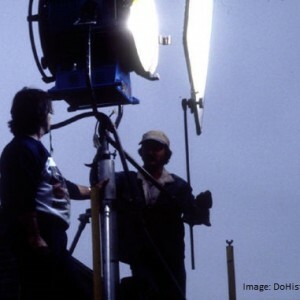 Gaffer – The gaffer is a fancy name for someone who handles the lighting in a film. Another title for the role is head electrician. Lighting is so critical to the overall story and mood of a movie, and it’s the gaffer’s responsibility to make sure everything looks the way the director wants it to look. Think of the different movies you’ve seen in the past. Was it a detective movie? It probably had some long shadows, deep shadows. How about that happy love story? Well, that probably had softer lighting, to soften the edges and not mellow the colors so they don’t “pop” like they might in another movie. The gaffer works with the Cinematographer and Director of Photography (or DP) to make sure they are all on the same page. Grip – The Grip works with very closely with Gaffer. It is the Grip’s responsibility to handle the non-electrical portion of the lighting. They move much of the set to get it looking right for the DP. The Key Grip is basically in charge of making sure the design of the set works with the lighting and creates the right look for what the DP wants. Best Boy – This is one role that always confused me growing up. I thought it might be the coolest role in the movie business (outside of the actors and directors, that is). Best Boy, can’t get much better than that, right? Well, it turns out, generally there are 2 Best Boys, one for lighting and one for grip. The Best Boy is simply the title of the top, most experienced person who works for the Head Gaffer or the Key Grip. Basically, they are the lead assistant to the Gaffer or Key Grip. Boom Operator – With Boom in the title, you know that this person works with sound. This is the person who holds the long pole with the microphone at the end, and extremely sensitive microphone. Their goal is to steady the Boom Microphone and hold it, right outside of the camera frame, so they can capture the best possible sound from the actors. If you read IMDB.com as much as I do, you know that a Boom Microphone showing up accidentally in film is one of the most common mistakes made. It is a difficult role! There are a ton of other roles on a movie set. Believe me, I use my trusty Wikipedia.com to do my research when I hear about a new or different title I’ve not heard before.